Leveraging on our industrious workforce, we are providing Compression Sprayer. Our clients can avail from us Hand Compressor Sprayer 9 LTR. These Hand Compressor Sprayer 9 LTR are appreciated by large number of clients due to high quality and durability. These products are available in market at most economical rates. Nature gold ngcs-12l 12ltr. Hand commpression sprayer. 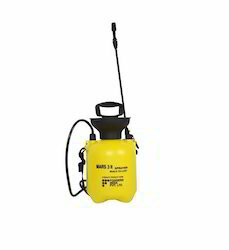 Professional mini sprayer with a capacity 2.5L. - Viton® seals and lever lock. after just a few strokes. Our clients can avail from us Mayur Hand Compressor Sprayers, which come with a brass tank of 14 liters capacity. Further, these are also equipped with 18x20 gauge and lance, trigger & NMD nozzles. 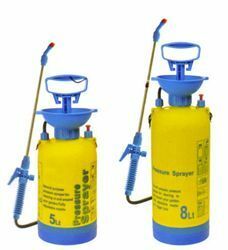 These durable sprayers are wear & tear resistant and are used in various sectors for fumigation and other such purposes. - Tanks Fabricated from Cold Rolled Industrial Quality Brass Alloy Sheets. - Welded Joints & Tested to 150 psi. - Fittings from Brass Forging. - Provision for fitting Pressure Guage. · Fully adjustable brass nozzle from spray to mist, lockable trigger mechanism and water flow regulator. AIROFOG PCO sprayers are designed for the professional pest control operator to deliver outstanding performance. The sprayers are finished to a very high standard and present a highly professional appearance to clients. We are offering Plastic Hand Compression Sprayer to our customers. We have gained a remarkable position in the market that is involved in offering Jupiter Hand Compression Sprayer.